In January 2019, a newspaper published a report that a private security company had been hired by the authorities in 2015 to conduct research and surveillance of protesters in Okinawa that have been opposing a U.S. military base relocation. Additionally, last month, a court upheld the guilty verdict against an Okinawan for his anti-U.S. base activities while two Hong Kong activists were arrested in Tokyo for protesting at a war shrine. In March 2019, Human Rights Watch published a report on abuses against transgender people. In February 2019, a joint report by the All Okinawa Council for Human Rights (AOCHR) and the International Movement Against All Forms of Discrimination and Racism (IMADR) raised concerns over the “continuous” restrictions on the right to freedom of assembly of people protesting the construction of the new U.S. military base in Okinawa. 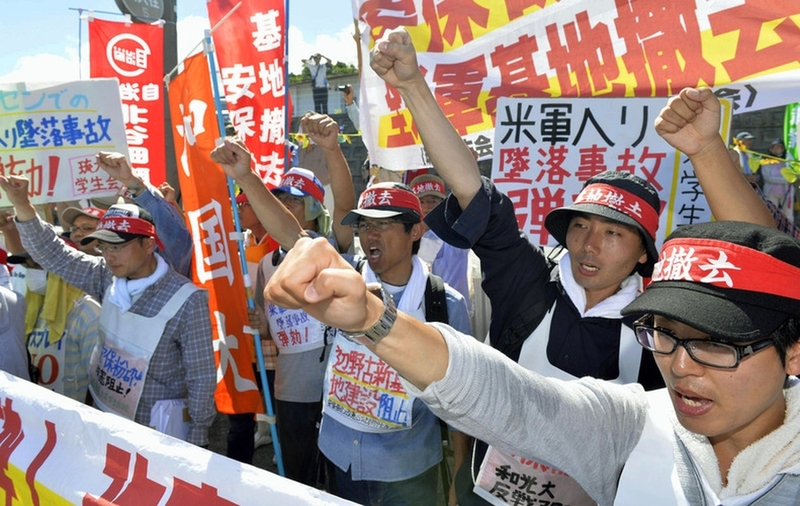 The document referred to an article by the Mainichi Shimbun newspaper in January 2019, that a private security company had been hired in 2015 on the request of the Okinawa Defense Bureau of the Ministry of Defense to conduct research and surveillance on a list of 60 protesters in Okinawa opposing the government's controversial U.S. military base relocation in Okinawa. The human rights organisations AOCHR and the IMADR found that the surveillance by the authorities has created a chilling effect, not only among protesters but more widely among people in Okinawa. According to the Mainichi Shimbun, who claimed to have obtained “copies of multiple reports written under the name of a senior Risingsun official”, the security contractor in question is Risingsun Security Service Co. based in Tokyo's Shibuya Ward. The firm was reportedly contracted by the Okinawa Defense Bureau to maintain maritime security, that also included preventing demonstrators from entering waters near the Henoko district of the Okinawan city of Nago. The list of protesters were placed on patrol boats used by the security firm. Demonstrators who could not be identified by name were described with special nicknames such as "white beard" or "dull." Another document reportedly contained information including the age and background of some of people, and it was stored at the company's local office in Henoko. The existence of a such list has been reported in 2016 by the Okinawa Times according to Mainichi Shimbun, but the government denied it had made a request. In December 2018, the Japanese high court upheld the guilty verdict against Hiroji Yamashiro an Okinawan activist and the chairman of the Okinawa Peace Activity Center for his anti-U.S. base activities. As previously documented, Yamashiro has become a symbol of Okinawa's resistance against the U.S. military bases. He was arrested on 16th October 2016 and charged with a number of protest-related offenses — from cutting barbed wire at a U.S. installation to obstructing police and businesses. He was sentenced in March 2018 to two years in prison with hard labour after trial in Naha District Court; however, that sentence was suspended for three years. He was previously detained in pre-trial detention for five months from October 2016 to March 2017. Also, in December 2018, the UN Working Group on Arbitrary Detention found Yamashiro’s detention to be arbitrary and violated articles 19 and 20 of the Universal Declaration of Human Rights and articles 19 and 21 of the International Covenant on Civil and Political Rights (ICCPR). Further, the group found that Yamashiro’s “deprivation of liberty constitutes a violation of articles 2 and 7 of the Universal Declaration of Human Rights and articles 2(1), 26 and 27 of the ICCPR, on the grounds of discrimination against a civic activist aimed at and resulting in ignoring the equality of human beings”. There have been ongoing protests for several decades against the U.S. military bases in Okinawa . The U.S. has about 26,000 troops spread over several bases in Japan, including some in densely populated areas. The foreign military presence since the end of World War II has contributed to the local economy, but resentment has built over the decades, with locals complaining of the noise and fearing for their safety. In December 2018, two Hong Kong activists were arrested in Tokyo while they were protesting at the Yasukuni Shrine dedicated to 2.5 million Japanese people killed in conflicts, including 14 of Japan’s World War II war criminals. The activists - Alex Kwok Siu-kit and Yim Man-wa – who are members of the Action Committee for Defending the Diaoyu Islands, had gone to the shrine to call on the Japanese government to apologise for the Nanking massacre in China committed by the Japanese forces between December 1937 and January 1938. According to news reports, following the arrest, both activists were charged for trespassing at the Yasukuni War Shrine and burning the symbolic ancestral tablet of Hideki Tojo, Japan’s wartime prime minister. Their lawyer called for their release and argued that their detention could not be justified and violate the Japanese constitution which guarantees the freedom of assembly and other forms of expression. In March 2019, Human Rights Watch (HRW) release a report “‘A Really High Hurdle’: Japan’s Abusive Transgender Legal Recognition Process,” documenting how the Gender Identity Disorder Special Cases (GID) Act harms transgender people who want to be legally recognised but cannot or do not want to undergo irreversible medical procedures like sterilisation. According to HRW, transgender people who want to legally change their gender must appeal to a family court under the GID Act, which was introduced in 2004. The procedure is discriminatory, requiring applicants to be single and without children under age 20, to undergo a psychiatric evaluation to receive a diagnosis of “gender identity disorder,” and to be sterilised.